Russia is working to resurrect a number of Soviet-built military facilities in Crimea that were used during the Cold War as a defense against naval attacks, Reuters reported Tuesday. A resident from Crimea's southern coast who was employed at a base last year said Moscow has begun stationing soldiers in the formerly abandoned bunkers and blocking the roads that lead to the areas. Tourists previously paid $50 to visit the former Soviet sites, but after Russia annexed the Crimean Peninsula from Ukraine in 2014, signs were erected barring visitors from entering a "forbidden zone of the Russian Ministry of Defense." The resident said in July the zone houses "a functioning military base with an anti-ship missile system." 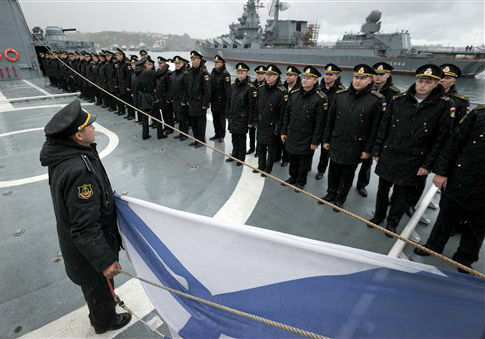 Moscow has also built new bases in the region as part of its plan to militarize the Crimean Peninsula. The Reuters investigation found that Russia has built or is in the process of refurbishing 18 military sites that include naval bases, radar stations, and airfields. NATO member nations like Poland and the Baltic states have mirrored this military build-up as U.S. forces strengthen patrols and conduct frequent drills. Russian Prime Minister Dmitry Medvedev said in February that NATO and Moscow have "in effect, slid into a new Cold War." Britain Defense Minister Michael Fallon said in September the nation had concerns over Moscow's military buildup in the area "and indeed the militarization of the Black Sea region generally." This entry was posted in National Security and tagged Crimea, Military, Russia, Ukraine, Vladimir Putin. Bookmark the permalink.